The date 1848 and immigration are indelibly linked, but it is a connection that many people, especially those espousing anti-immigrant rhetoric hardly ever make. 1848 is the year the Treaty of Guadalupe Hidalgo was signed and the United States “acquired” the Southwest, and in doing so, reduced the size of Mexico by half. The end result of a war which President Ulysses S. Grant stated, “I was bitterly opposed to the measure, and to this day, regard the war, which resulted, as one of the most unjust ever waged by a stronger against a weaker nation… I do not think there was ever a more wicked war...I thought so at the time...only I had not moral courage enough to resign." President Grant was not alone in his opposition to the war. President Lincoln, then a Senator, challenged President Polk as to the validity of the cause of the war in his “spot resolutions”. Additionally, Henry David Thoreau would write his famous essay, “Civil Disobedience”, in response to a stint in jail for protesting the war by not paying his taxes. Nonetheless, the connection that 1848 and immigration have, is the question of who exactly is an immigrant? 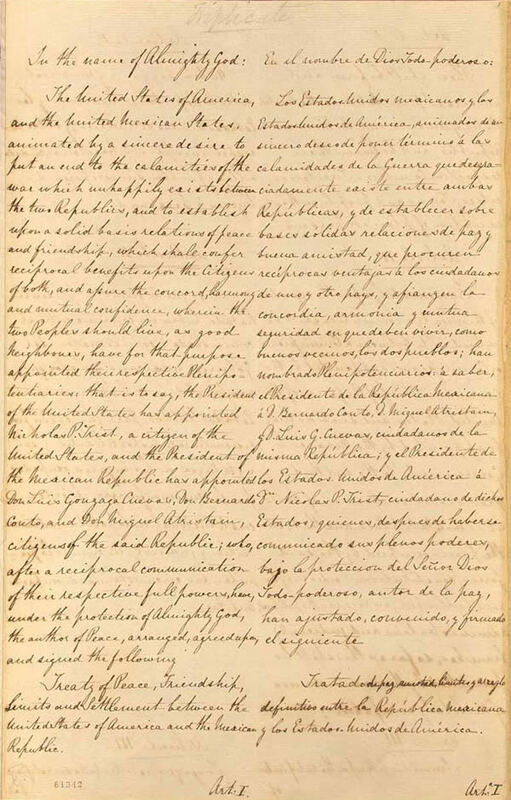 According to Article VIII of the treaty, “Mexicans now established in territories previously belonging to Mexico…shall be free to continue where they now reside, or to remove at any time to the Mexican Republic, retaining the property which they possess in the said territories…[those] who shall prefer to remain in the said territories may either retain the title and rights of Mexican citizens, or acquire those of citizens of the United States”. The wording of the treaty seems to create a situation in which Mexicans were welcomed into the new borders of the United States. However, sadly this was not the case. Through violence, threats and other methods, many Mexicans were relieved of their lives, lands, and forced to flee from their land. Not to mention that even before the establishment of New Spain and later the nation of Mexico, the Southwest was occupied by Native Americans many of which would later go on to intermarry and become Mexicans. Consequently, those that were forced from the Southwest and moved into Mexico and beyond had their original roots in what is now the United States. This concept is at the core of the mythic legend of Aztlan which posits the origins of the Aztec people as the area that was taken from Mexico in the Treaty of Guadalupe Hidalgo. This idea of “stolen lands” and a longing to go back home is a concept that has thus far been omitted from the debate on immigration. Although referred to as the myth of Aztlan, the idea behind is very real. Regardless, whether you believe in the legend or not, the fact that America engaged in a war that 2 U.S. presidents pointed out should never have been fought, resulting in the loss of over half of Mexico’s territory, is not a legend, it is a historical fact. Additionally, those that were forced from their homes in the Southwest, have their origin and homeland in the Southwest. As a result, the answer to who is an immigrant is more complicated than some would think. For, if the Southwest was actually the original homeland of people who fled south of the Rio Grande, are they not then returning home and not entering into a foreign territory. This argument opens up a new dynamic in the immigration debate. The fact these people were displaced by the actions of the very government that promised their lands, and personhood would be honored and protected. This leads to a question of legitimacy and whether these so called “immigrants” are immigrants at all, or are they simply the Aztlandian diaspora returning to their homeland. This calls into question the need to recreate the immigrant narrative. To see Mexicans as anything other than immigrants is to recognize that they belong here, that this is their home. Therefore, we label them immigrants in order to de-emphasize the reality of their situation; that they have been living in a land that is foreign to them and they have now made the journey back home. Labeling Mexicans as foreign immigrants is the lens being used in the current immigration debate, but this is not a historically accurate picture. Nevertheless, it does serve a purpose, and that is to criminalize and turn a more nuanced topic to a very simplistic one that is easy to understand. Terms such as “legal” and “illegal” are used to remove the humanity from people whose origins in this land pre-date those who now label them as illegal and serve to justify the “land grab” which was the Mexican American War. Thus, the debate itself is flawed. A more nuanced understanding of the true origins of these “immigrants” will allow for a more humanizing perspective. In fact, it will help begin to heal the harsh jagged wound of a border that was created in 1848.